These women all seem happy with their water. But what discontents lurk behind those smiles? Over the past couple of years there’s been a growing recognition that drinking water policy is an environmental justice issue in the United States; my research with David Switzer showed racial, ethnic, and socioeconomic disparities in drinking water quality at the community-level—findings that have since been affirmed by other researchers. Identifying racial and ethnic disparities in drinking water service at the individual level is harder. Do people of different races and ethnicities experience water service in markedly different ways? A few months ago I posted some findings from a Texas A&M Institute for Science, Technology & Public Policy (ISTPP) national public opinion survey. The survey’s carefully-designed sample of nearly 2,000 individuals is representative of the US population, and so offers an extraordinary look at public perceptions about water service. Earlier posts reported on attitudinal differences between water professionals and the general public, how gender predicts opinion on water issues, and the correlation between income and water service experiences. Today I’m looking at race and ethnicity. 56.7% of respondents reported experiencing none of these problems. It’s important to remember that the survey captures perceived water service problems, not actual problems—for example, we don’t know whether a respondent actually experienced low water pressure, we only know whether a respondent thinks (s)he experienced a problem. Happily, a large majority of respondents said that they had not experienced each of these problems. It’s not a pretty picture. A generally ordered relationship emerges, with Black respondents reporting the most water problems, followed by Hispanics, with non-Hispanic Whites reporting the fewest in four of the five categories. Non-Hispanic whites were most likely to report no problems at all. 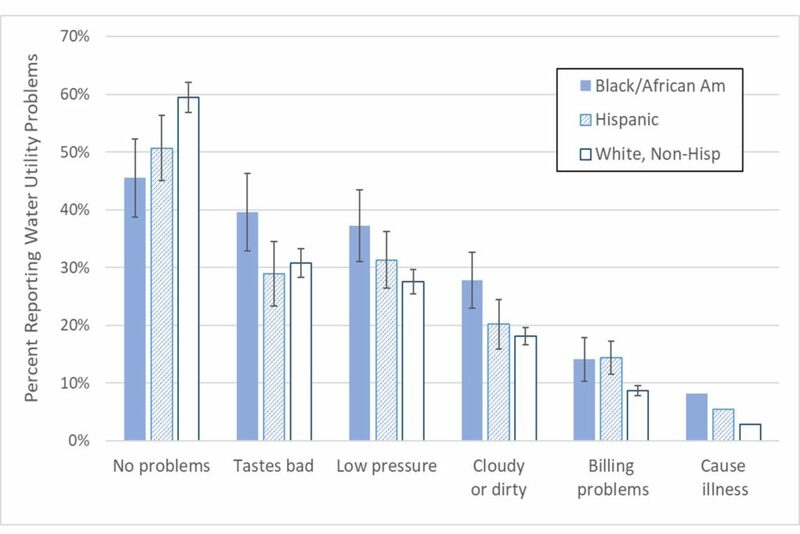 Black respondents reported experiencing water service problems much more frequently than did respondents of other races across all five categories. The differences between Black and non-Hispanic White respondents were large and statistically significant in all categories. For example, 37% of Black respondents reported experiencing low water pressure, compared with 28% of non-Hispanic Whites. 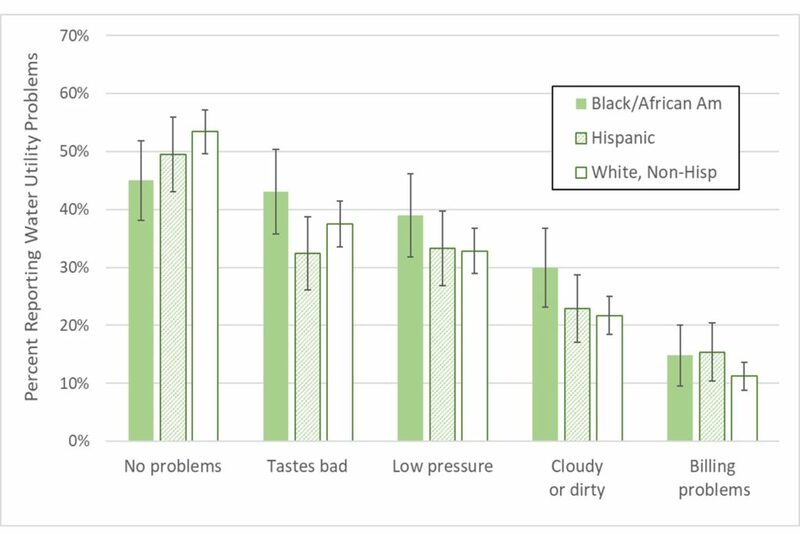 29% of Blacks reported cloudy or dirty water, compared with just 18% of non-Hispanic Whites. The disparities between Hispanic and non-Hispanic White respondents were less stark, although significantly more Hispanic respondents reported experiencing water bill problems and illness compared with non-Hispanic Whites. How much do racial/ethnic patterns just reflect income? When adjusting for income, age, and region, the racial and ethnic disparities persist, but are less pronounced and in most cases not statistically significant by the conventional standard. So while there are clear racial and ethnic differences in water service experiences in the United States, these data suggest that much–but probably not all–of those differences reflect racial/ethnic income disparities. *The survey captured only two racial categories (Black & White) and one ethnic category (Hispanic), so we can’t analyze other racial or ethnic groups.